Most of you know that I’m a sports mom. Having two boys who both play sports year round, I know a thing or two about stinky smelling clothes. But, ya’ll, NOTHING prepared me for how bad teenage boys stink after a few hours in the gym or on the field. 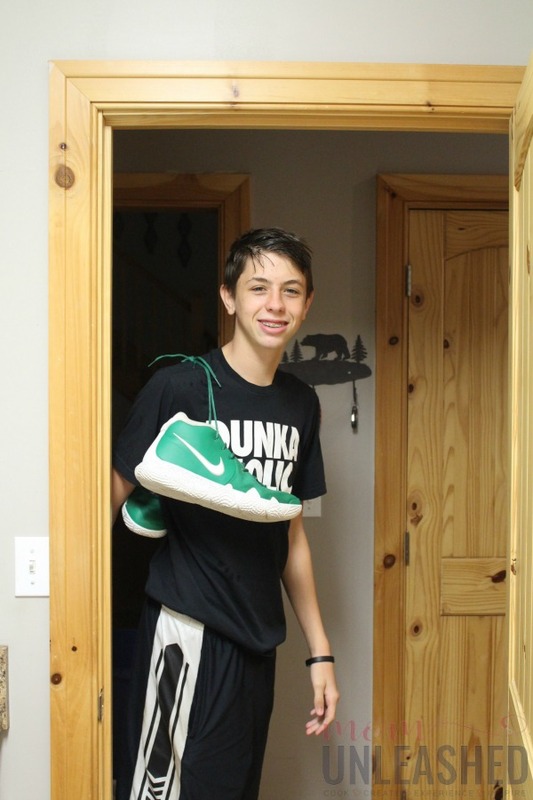 Over the past few months since my oldest headed back to school, I’ve found myself time and time again sniffing his sports clothes (and him when he’s wearing them) and wondering why I can get rid of that underlying stink that just seems to always linger. I’ve tried pretty much every detergent option out there. I’ve tried soaking his sports clothes in advance. I’ve even considered giving him away just so I don’t have to smell him (I kid but honestly, it’s bad!). I’ll be honest and say that I was about at my wits end and then I discovered the secret that every sports mom needs to know. 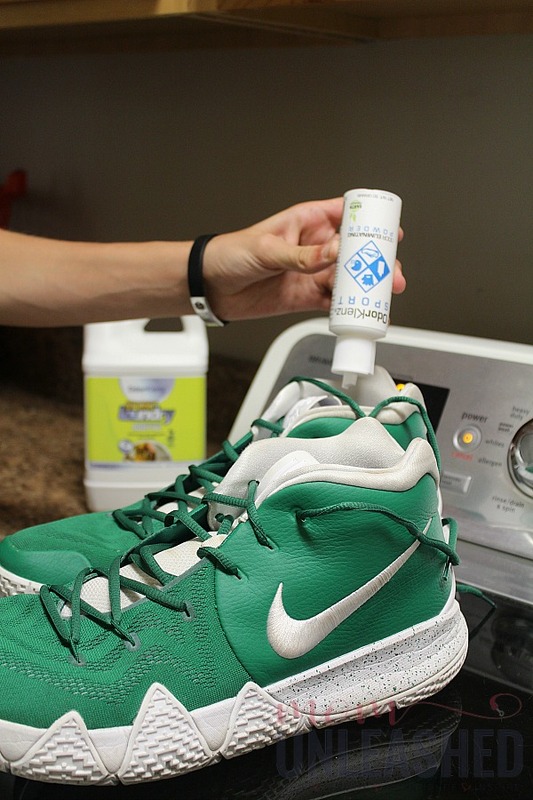 Now, I want to share with all of you how to get rid of sports odors in laundry in the easiest (and most effective) way! Like I said before, I’ve struggled with the smell of my teenage son’s sports clothes for quite some time. Let me just paint a little picture for you. He goes to an all boys school where sports are required every afternoon. So, just picture all these boys sweating, playing and then throwing their clothes into their locker afterwards to wear again the next day because, well, there are no girls to smell them so who really cares? Are you feeling my pain yet? Now, thankfully my son at least changes shirts every day but that shirt he wore the date before? Well, sometimes it sits in his locker for a few days marinating….meaning that by the time his sports clothes make it home to me, he’s the only one smiling about it. Now, trust me when I say do not let that smile fool you….the boys stinks when he comes through my door and we’re talking about those sweat odors that are seemingly impossible to get rid of….until now! You see, I’ve come up with a 3-step process that is helping me to get his sports clothes clean….and I mean really, really clean where the old smells don’t come back through as soon as he starts sweating again. Even better, I’m going to share with all of you gasping-for-fresh-air-when-you-do-the-sports-laundry mamas my secret 3-step process. Truth: this doesn’t have to be anything fancy but get a basket that is specifically designated for those smelly sports clothes. If you have somewhere away from you to put it where you don’t have to smell it until it’s ready to be washed, even better. 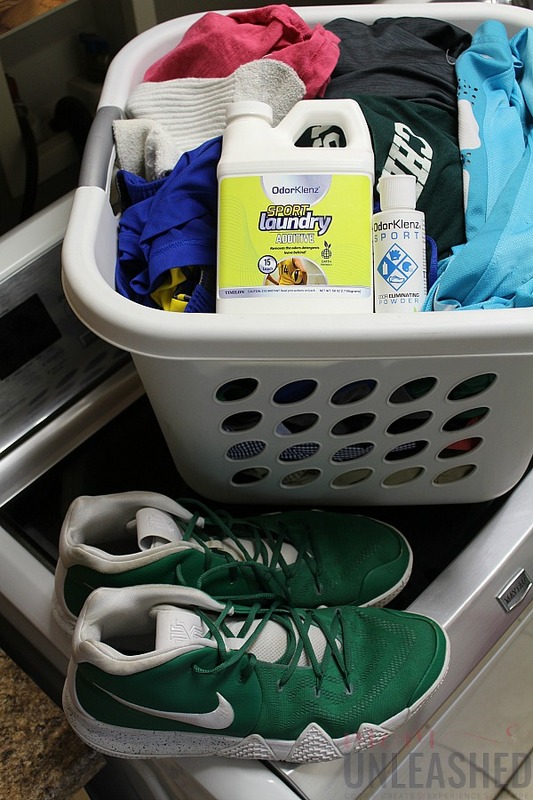 Then tell your teen that this basket (and only this basket) is the location where his (or her) sports clothes need to go. Honestly, I’m not above telling my son to strip down to his skivies when he walks in the door and throw his clothes on in there. That way they don’t co-mingle and infect his regular clothes with that unique odor that sweaty, teenage boys excrete. Now, this is really my secret weapon when it comes to beating sports odors. 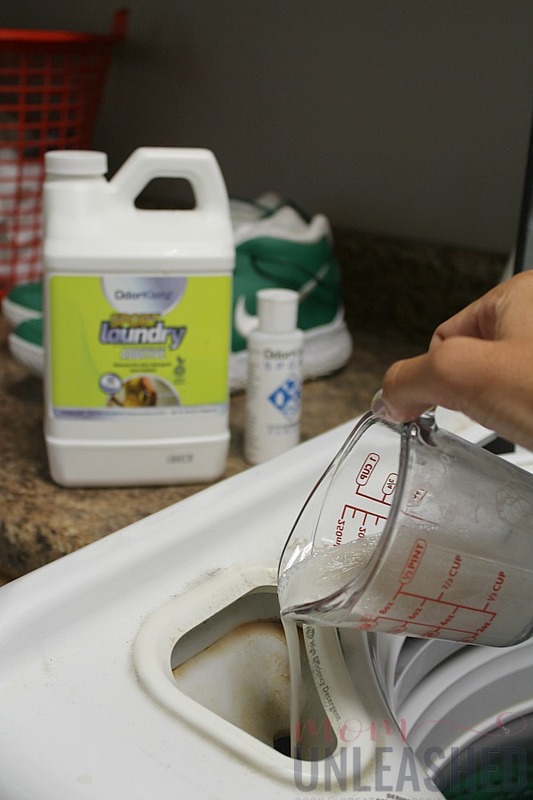 You go on and try every detergent known to man and hope it works but from my own experience, I know that until you add OdorKlenz Sports Laundry Additive you’re still gonna be sniffing every piece of sports clothes wondering why you can get the stink completely out. If you want to skip all those loads of test laundry which I can tell you aren’t going to work, you can just go ahead and order your OdorKlenz here (and get 15% off using the code MU15). So, now that you’ve ordered, let’s talk about what makes OdorKlenz different and why you need a bottle (or 2 or 3) of it if you’re the mom of a teen athlete. 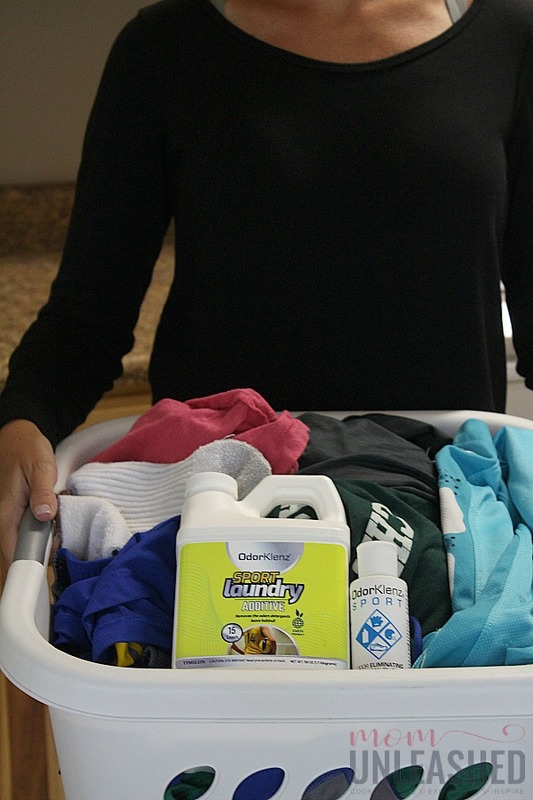 OdorKlenz Sports Laundry Additive is not a detergent but is designed to use along with your detergent to get rid of those really stinky, really tough odors that get stuck in sports clothes. Made from safe earth minerals, this formula is non-toxic and safe to use around my family (including our pup Ollie) and utilizes a patented technology that actually removes odors at the source (instead of simply masking them like detergents often do). OdorKlenz contains NO masking agents (this is super duper important if you want the stink to actually be gone) and is quick and easy to use. In fact, it takes seconds to add OdorKlenz to my son’s laundry and the results are worth smelling! So, how do I use it? Well, remember that laundry basket of sticky, smelly sports clothes from earlier? When it’s time to wash, I put on my gas mask (or just hold my nose really tightly) and gingerly drop all those smelly clothes into the washer. Then, I add my regular detergent and go one step further by adding my OdorKlenz Sports Laundry Additive. I can add 1/4 of a cup to smaller loads or 1/2 of a cup to larger loads. I just pour it in the same slot as the detergent goes into, close the top and let the OdorKlenz do the rest! Now, we’ll talk more about results in just a few minutes but there’s one more step in ensuring my son doesn’t stink before we get to that! 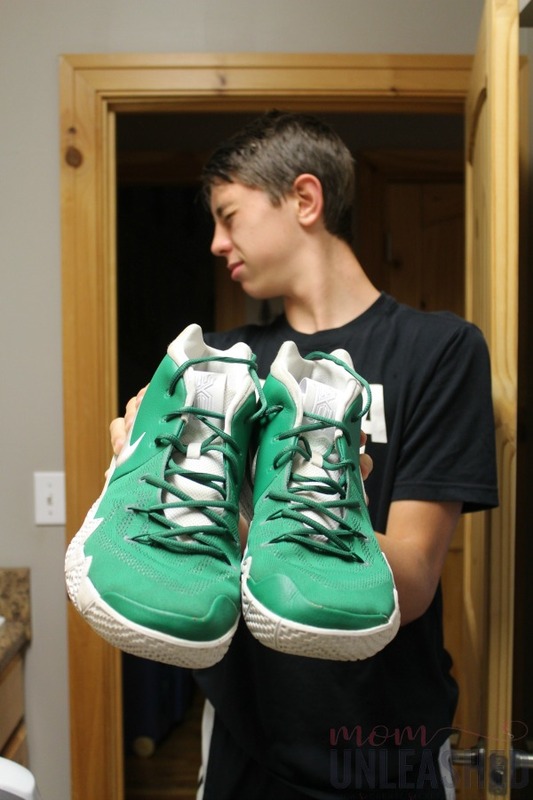 While my son’s sports clothes are getting a good dose of OdorKlenz to make them smell perfectly fresh again, I always take care of the shoe stink as well. I’ll tell you why. The first few times I used OdorKlenz, I was thrilled with the results but when he would get into enclosed areas (like my car) the smell was still there. I knew it wasn’t his clothes because trust me, I sniffed them 10 different ways after using my OdorKlenz Sports Laundry Additive. After a little confusion, I happened to notice his big old feet and found at that the offensive odors were coming from there. 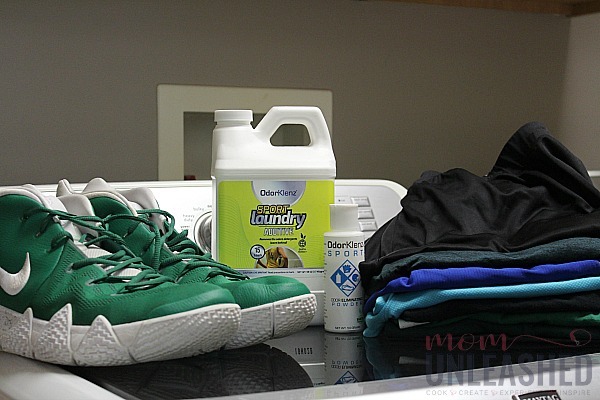 Now, the whole goal of my laundry life is so that I DON’T have to smell that boy stink so I was thrilled that as part of my laundry routine, I can use OdorKlenz Sports Powder in his shoes. This powder is specially formulated to neutralize and eradicate foot odor from the source. As a bonus, it’s crazy easy to use….all I have to do is open the bottle and squirt the powder into his shoes for relief from that gosh-awful foot smell! Then I simply let his shoes sit while his clothes finish washing and drying and at the end of my 3-step process, I’m rewarded with sports clothes (and shoes) that smell amazing, look fresh and don’t get that funky smell the minute they are put back on! 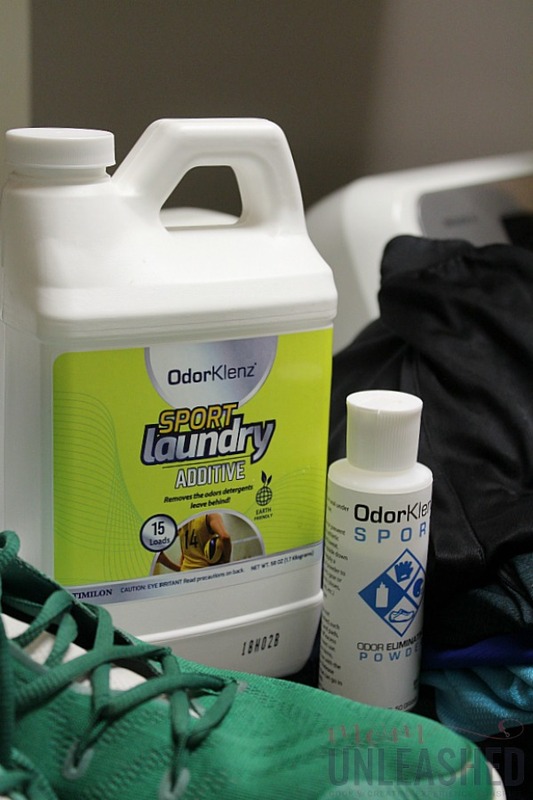 In fact, while I don’t think my clothes will ever smell like his, I’ve even started using this OdorKlenz products on my own workout clothes because I know that if they can tackle his smelly, awful sports clothes, they will keep mine smelling fresh no matter how hard I work out. 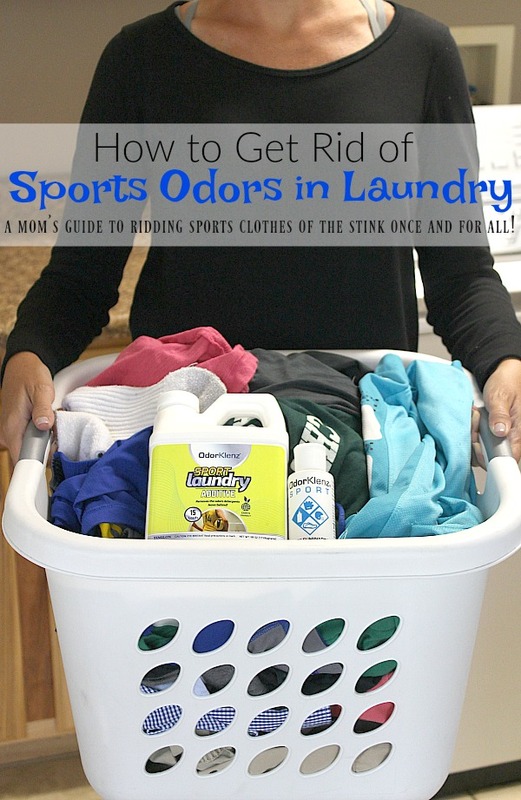 If you’re a mom who has been struggling with stinky, smelly, can-almost-stand-on-their-own sports clothes, don’t go another day without discovered like I did that sports clothes don’t have to stink! And stop wasting your time with soaking and searching for ways to get rid of those sports odors. Instead, order your OdorKlenz Sports products today by clicking here and save 15% off OdorKlenz products when you use the code MU15 at checkout! So don’t wait another minute! Order your OdorKlenz Sports products today (or any of the other OdorKlenz products) and they will ship the very same day! Now tell me, who in your family will you want to spend more time with after washing their sports clothes in OdorKlenz? Wish I had this when we had teenagers. Their gymn and sports cloths smell so bad when they bring them home. My husband’s clothes are the worst because his smelly gym clothes sit in his car all day. I need to try this for him! My boys are only 5 and I am surprised at how they already have stinky feet! I can’t imagine how much this will increase when they are older! I actually think TIDE does a really good job of this in all honesty!! I never have any residual smells on my work out clothing! I need to try this! I can have some stinky kids with their stinky clothes, so this sounds like it’ll help with that! Oh, and my husband can have stinky uniforms too. I wish I had known about this sports additive back when my kids did karate. Their karate uniforms got pretty crusty. Oh my! I need this fo ray workout gear, it smells so bad sometimes!! LOL!! Thanks for the heads up!! That’s a great tip to keep a separate basket for sports laundry. I am glad you finally found a solution to getting rid of sports odour! 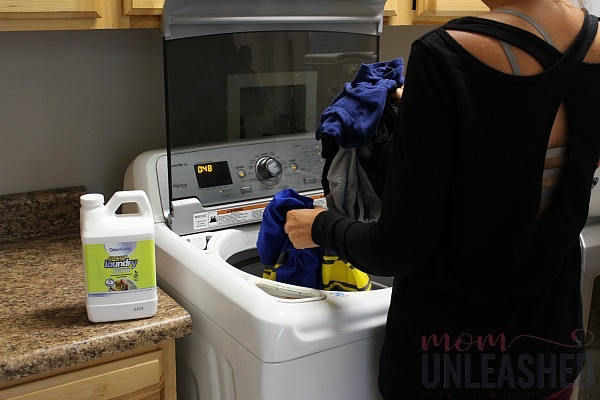 I have been washing things more than once to try to get rid of stains and odors. I will have to give this a try. I have not heard of this product but I do have a few items of clothing I’d like to try it on after we bike in the summer humidity for sure! You were cracking me up talking about your stinky smelly boy! I love your tips, I’ll be sharing them with my two nieces who have very athletic young men. I’m a sports mom as well. With football season being in full effect. I have to look into getting these products for my home. My boys aren’t into sports yet, but I still get smells from them. I can only imagine when that time comes! It’s always great to have a product that helps! My cousin is just sharing me a story about the odors in her kids room and reading this makes me think that this might actually help her problem. Gotta share this to her. With three girls, luckily I haven’t faced this battle yet. Though, I’m sure I will at some point. Heather recently posted..Happy Cards &#8211; The Perfect Gift + Your Chance to Win a $200 Happy Teen Card! At this point I will take anything that works. The socks and underwear are just so stanky! I have not heard of Odorklenz Sports but it sounds like a great product. With three boys in the house, I do need something like this!